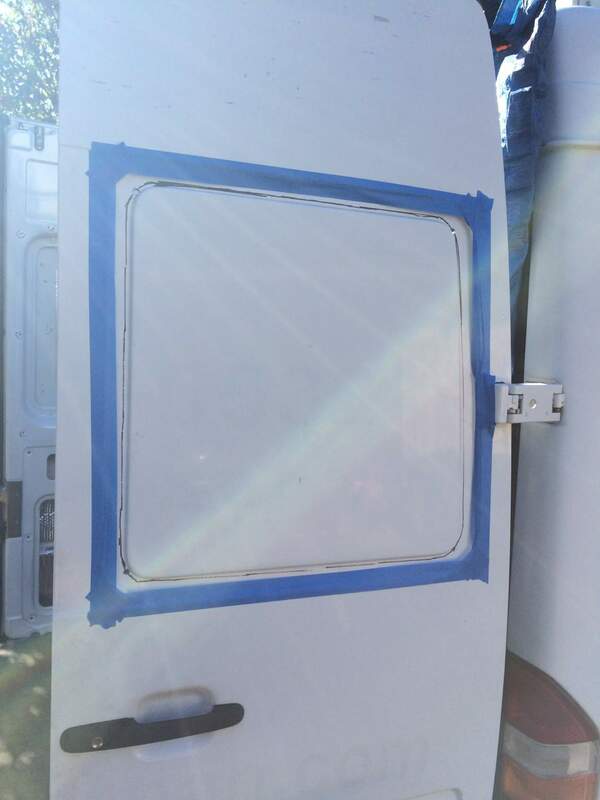 Even with the additional two big windows in the side panels, the rear of the van was still quite dark during the day, so I decided to put some windows in the rear doors. After some research I settled on windows from a company in Washington, called Peninsula Glass. They specialize in made to order windows for RV’s and Boats and they have a sweet setup for T1N Sprinters. 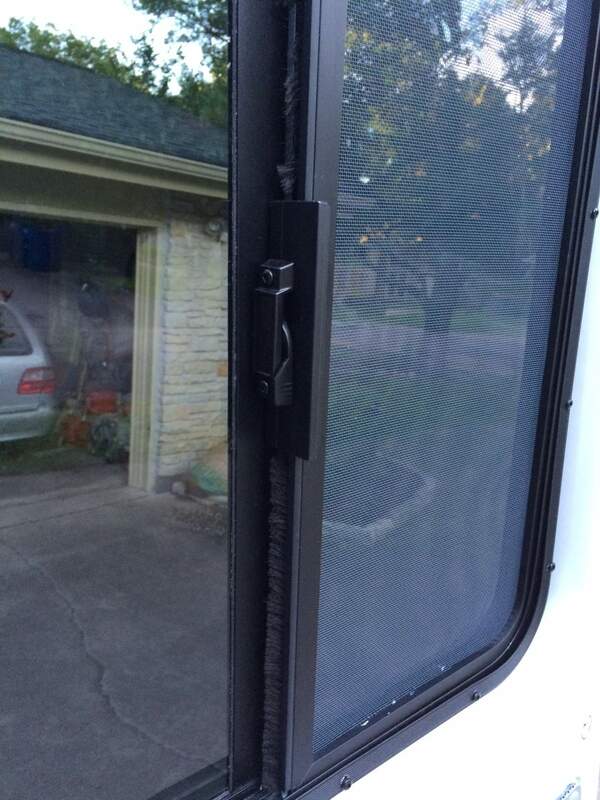 To my knowledge they are the only manufacturer that sell sliding windows for the rear doors. The installation is exactly the same as with the bigger windows for the side panels: Cutting the openings and then screw the window and the inner frame together. First, depending on the cutting tool you’re using protect the door from scratches. I’m using a jigsaw, so I needed some painters tape on the outside of the cutting line. Take a look at below picture for a rough idea what you need to cut out. When you’re done cutting, grinding, deburring, priming and painting your rear door should look like this. With the help of a second person place the window frame with the glass from the outside into the door (don’t forget to add the gasket) and screw the inner window frame from the inside. The included screws have a square head drive, make sure you have the right bit before starting this job. The best feature of these windows is that you can slide them open. The screen is included and will make sure you’ll only get a breeze in the van but no insects. Opening the sliders and have the fantastic fan pulling air out gives a nice breeze through the back of the van. The final result is shown in the picture below. With some experience now it took me about two hours to put both windows in. And both windows installed in the rear doors. The windows are quite pricey and in my case there was a 7 weeks wait since they were out of stock and very busy with other jobs. Was it worth it? Yes, totally. Not only the additional light in the back but having sliding windows that you can open while you sleep is priceless. 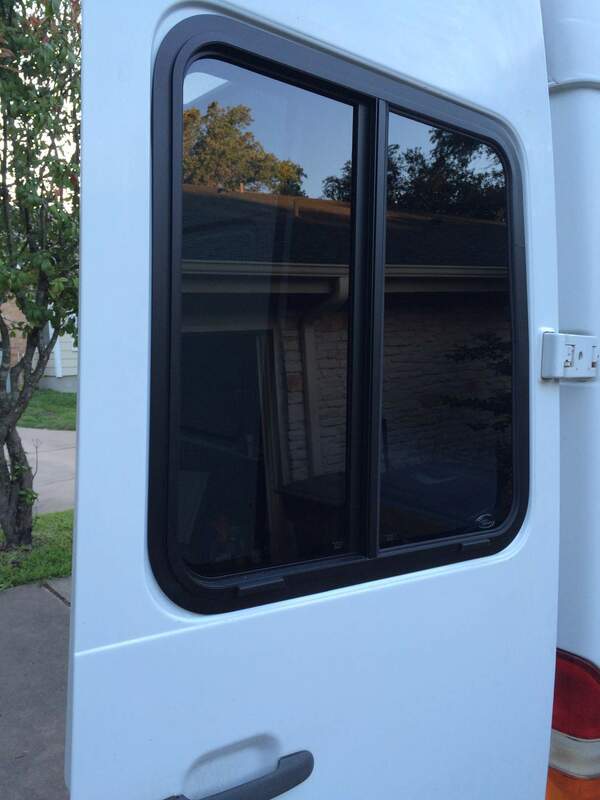 Rear door windows from Peninsula Glass. I don’t yet know who you are, but I just might be your new biggest fan! How many times have I wished for this exact mod?! Oh my gosh. 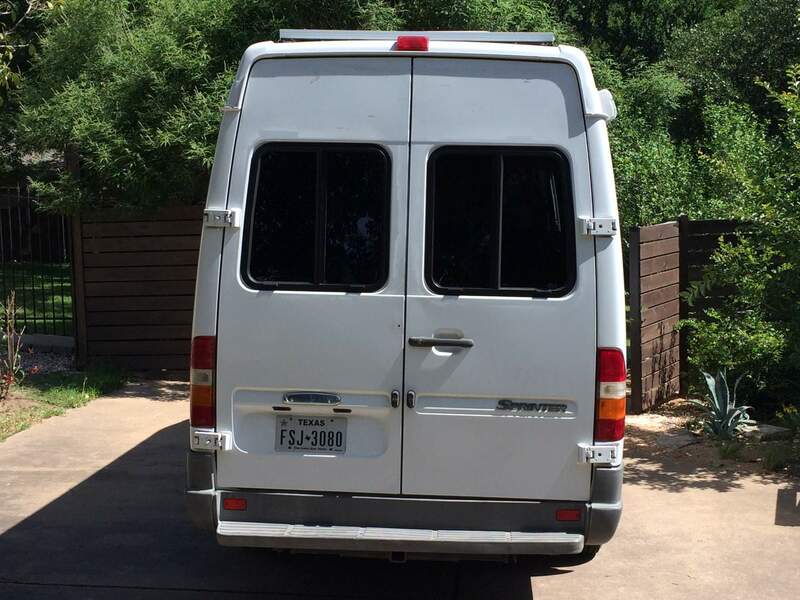 We, too, are running a T1N Sprinter-based camper van blog and we are also in Texas. We’ve got numerous DIY jobs posted up there with more to come (lithium and a custom hitch carrier in particular). I’m very much looking forward to seeing more of your content, and thanks so much for this one! Thanks! Looks like you spent a lot of time modifying your Airstream. The door is looking awesome and nicely fitted. 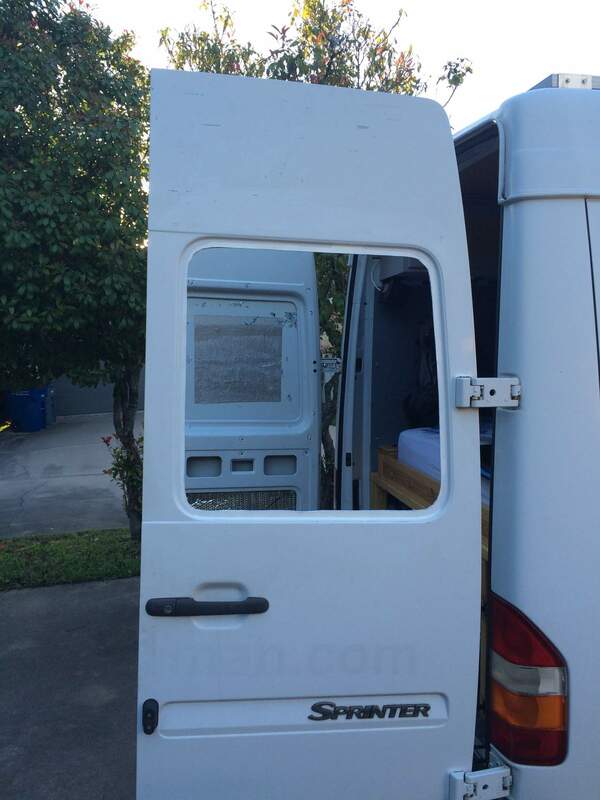 You can get more about sprinter van rear door ideas; meet me at VMT Enterprises. I don’t know if this is true but I was under the impression that the auto manufactures didn’t put opening windows in the rear of vans any longer was due to the possibility of exhaust fume entering? Paul, that might be true. I could smell the exhaust fumes when I forgot to close the rear windows. Even when driving sometimes. I would definitely close the windows when the engine is running.